This post comes to you two weeks delayed. Originally, I was disappointed with how the pictures turned out, so I decided not to post about them. But yesterday when I was scanning back through them, I liked them better than I did initially. (Do you find this ever happens to you with creative things? Like, sometimes I write something and I think it's pretty awful but then when I go back and read over it a while later I think, "Hey, this actually isn't half bad.") So, cue Thanksgiving Break Flashback! We've actually made these rolls once before, for our dad's birthday breakfast back in October. The whole rising process didn't quite go flawlessly, but they were still so scrumptious that we decided we wanted to give them another try! It's a good sign when even when a recipe doesn't turn out perfectly, it's still delicious. The yeasting was more successful this time, though still not perfect. But they're pretty bodacious anyway, no? I think working with yeast is just one of those things that start to go more smoothly with practice. So don't let the daunting prospect of yeast deter you! Just think of it as a learning experience. Also a less-than-perfection-can-still-be-exceptional experience. A spicy cinnamon, warm, soft dough, melty cream cheese frosting experience. An "mmm, delicious" experience. I think you can tell what a hit these were by how few were left by the time we'd cleared the breakfast table. Though we didn't eat them on Thanksgiving morning - we were saving ourselves for the feeding frenzy that would be our early afternoon dinner buffet - they would make an excellent holiday breakfast. The pumpkin + cinnamon + cream cheese flavors are very much a festive combination, even once Pumpkin Season is pushing its expiration date. 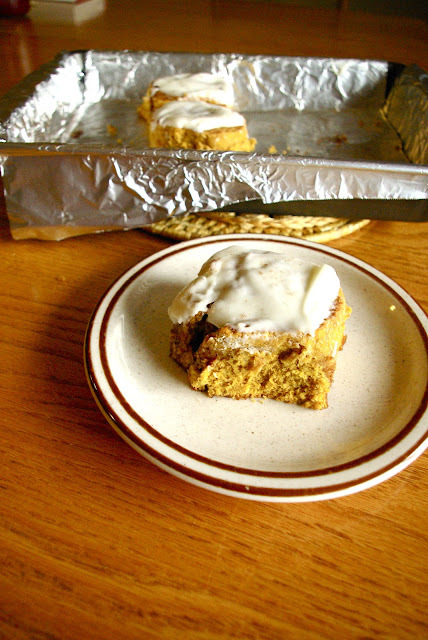 Unlike some other "Pumpkin Spice" cinnamon roll recipes, the pumpkin flavor here is not shy. The pumpkin is stirred right into the dough, resulting in a undeniably pumpkin-y roll, set off by the classic cinnamon roll accoutrements of a generous cinnamon sugar filling and gooey cream cheese frosting. The stickier your hands and face are after you're done downing your second roll, the better. I think a lot of people are intimidated by homemade cinnamon rolls, due to the whole yeasting/rising thing and the general time commitment. If these were regular old cinnamon rolls, I'd say save yourself the trouble and just go Pillsbury. But you're not going to find the unique flavor of these pumpkin rolls in any grocery store just-bake-and-serve package. In this case, the trouble and time investment is more than worth it, yeasting disasters included. I promise. Scrape mixture into a large oiled bowl and cover with plastic wrap. Set aside for 1 hour in a draft-free place; it should just about double. While it is rising, line the bottom of two 9-inch round cake pans (8-inch round should work too, as does an 8-inch square) with parchment paper and butter the sides of the pan and the paper. Starting on a longer side, roll the dough into a tight spiral. It’s going to make a mess because the dough is crazy soft and some stuff spills off the ends; don’t sweat it. It will all be delicious in the end. With a sharp serrated knife, using absolutely no pressure whatsoever (only the weight of the blade should land on the dough) gently saw your log with a back-forth motion into approximately 1-inch sections. When a soft dough like this is rolled, it tends to grow longer, which means that you’ll have the option to either make more buns (say, 18 instead of 16) or just cut them a little larger (in generous inches). Divide buns between two prepared pans. You can sprinkle any sugar that fell off onto the counter over them. Cover each pan with plastic wrap and let rise for another 45 minutes. If you’re doing this ahead of time, you can now put them in the fridge overnight. In the morning, leave them out for an hour to warm up and finish rising. Finish your buns: Remove the plastic and bake buns for 25 minutes, until puffed and golden and the aroma is like a snickerdoodle. Transfer pans to wire cooling racks and drizzle/schmear with cream cheese glaze, then have at them. the yeast is not rising. i tried for two days. three times. the yeast hasnt expired or anything. ive used it to make bread recently. what am i doing wrong? I would make sure the milk isn't too hot, just warm to the touch. And sprinkle the yeast over the top, don't stir, and just wait. If that doesn't work, I'm not sure what could be going wrong. If all else fails, get new yeast and try again, because yeast can be very tricky and small things can make the whole process get thrown off.